Noticing a correspondence between abrupt warming on Earth and increases in methane concentrations, some scientists have pointed to methane hydrates as the culprit in past climate changes. They say that these undersea icy deposits of methane and water could have destabilized en masse, releasing large amounts of methane into the ocean and then into the air, thus causing atmospheric warming. New research, however, is indicating that for at least three abrupt warming periods over the past 40,000 years, abrupt warming was accompanied by, but not caused by, an increase in methane, and the methane increase was from the land, not the sea. 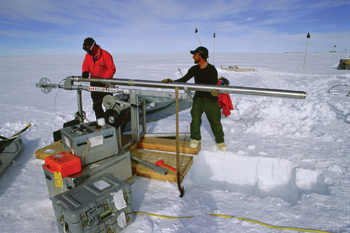 Researchers Todd Sowers and Jay Kyne drill an ice core in Antarctica as part of the West Antarctic Ice Sheet Divide project. Ice cores are helping to illuminate the causes of past abrupt climate change events. Photo by Mark Battle. Todd Sowers, a paleoclimatologist at Pennsylvania State University in University Park, wanted to figure out the nature of the rapid increases in methane during the last three abrupt warming periods (38,000, 14,500 and 11,500 years ago). He specifically wanted to test “if we could locate destabilization events” when atmospheric methane concentrations abruptly increased, he says, to determine the source of the events. In addition to the possibility of the gas coming from methane hydrates, another possibility is that during the abrupt warming events, changes in the hydrological cycle led wetlands to suddenly release large concentrations of methane. Methane released from methane hydrates leaves a very different isotopic signature from that released by wetlands, Brook says. Therefore, Sowers turned to ice and its chemistry. Sowers extracted air bubbles from a Greenland ice core known as the GISP II core. He then measured the atmospheric concentration of methane in the air bubbles, as well as the deuterium-to-hydrogen isotopic ratio in the methane — a “very hard measurement and a great achievement,” says Ed Brook, a paleoclimatologist at Oregon State University in Corvallis. The core samples at all three intervals showed that methane from methane hydrates was relatively stable or even slightly decreased, even while overall methane concentrations were spiking, Sowers reported in the Feb. 10 Science. Furthermore, Sowers says, temperatures in Greenland increased simultaneously with or slightly before methane increases in the atmosphere. The results, he says, definitively rule out a massive release of methane from hydrates and just about rule out methane increases as the cause of the warming (though increasing methane almost certainly furthered the warming). Another remaining uncertainty is what happened at other periods of abrupt climate change, Brook says, such as the Paleocene/Eocene boundary some 55 million years ago, an abrupt warming period that has long been thought to have been caused by destabilization of methane hydrates. Sowers cautions that his data “cannot say anything at all” about time periods other than the ones he tested. He also cannot extrapolate the data to say anything about the future, and whether or not methane hydrates could suddenly collapse and release tremendous amounts of methane into the atmosphere.